Attempting to connect to my Jetty server to debug a new RTC Extension I was working on in RTC 4.0.1, failed with an SSL error with all my current Browsers, Chrome and Firefox without being able to find a workaround in the browsers. How to work around that issue? This problem only occurs when using the RTC SDK for RTC versions prior to RTC 6.x. It will affect all of these versions. It does not prevents performing the RTC Extensions Workshop since most of the tasks there can be done using the Eclipse UI. However, it impacts developing RTC Server extensions and test them properly, if it is necessary to use the Web UI because it is impossible to go into the web UI to test. The problem I ran into is basically related to Chrome Does Not Work With RTC Debug Server on Jetty. However, it turns out that the work around described there does no longer work. Neither Tomcat nor Chrome allow to enable SSL V3 anymore showing errors like this in FireFox. Firefox cannot guarantee the safety of your data on localhost:7443 because it uses SSLv3, a broken security protocol. You can download Chromium of various versions here. Version 44.0.2385.0 does still work for me and it does not update automatically. The development team tracks the issue in Defect 354890. As long as there is no other solution, use the workarounds provided above. As soon as there are new news, I will try to provide the details. Recently I tried to use Chrome with a RTC debug Server running on Jetty. I was unable to do so. Why does this happen and is there a work around? This problem only occurs when using the RTC SDK for RTC versions prior to RTC 6.x. The RTC 6.0 and later SDK’s are not affected as they enable TLS. * Update * see Unable to Connect to the Jetty Server Using Current Browsers Due to SSL Error Extending RTC Versions Lower Than 6.x for newest developments and potential workarounds. This work around does no longer work for the newest versions of Chrome. I created Defect 354890 to get it addressed. As described in the defect above, it appears that Jetty uses SSL as a default protocol to talk to the browser. 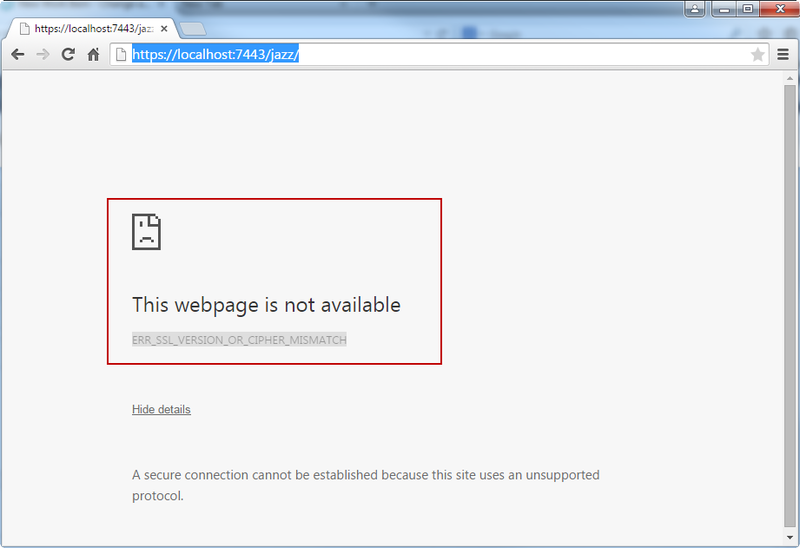 Chrome version 4 has disabled SSL due to defects in the older SSL implementations. This can basically also happen in other browsers soon. To fix this, Jetty would have to be set to TLS as default. Although this seems to be the documented default for newer versions, the SDK does not seem to have that setting. I searched around and was also not able to find a way to force it. It would be good if there was a way to set e.g. a System Property in the server launch configuration. Open your public URI https://localhost:7443/jazz/ again. You will be redirected to a page “Your connection is not private“. Click on the “Advanced” link. Finally click on “Proceed to (unsafe)“. Chromium has the same problem. And the same fix.